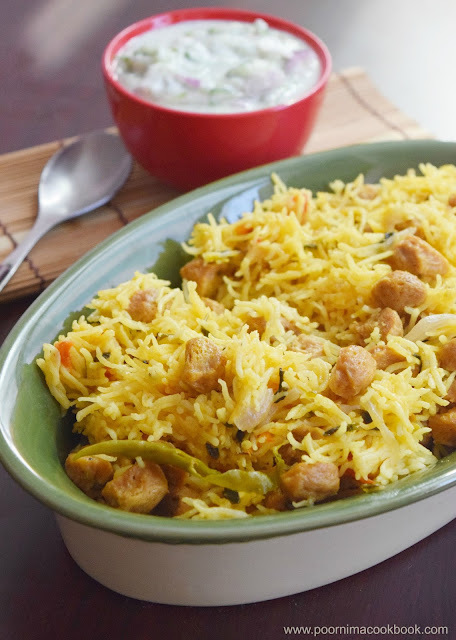 Try this healthy and flavourful biriyani using Soya chunks / Meal maker. I am sure it will be a delightful treat for vegetarians! Soya chunks is a rich source of protein and also low in cholesterol when compared to to animal proteins. It is also a good source of amino acids, vitamin and minerals. Wash 2 to 3 times and squeeze the water completely; keep aside. Wash and soak the rice in water for nearly for ½ an hour. Chop the onions lengthwise and chop tomato into small pieces; keep aside. Once it crackles; add onions and stir well till it becomes translucent. once it is done add green chillies, chopped tomato and ginger garlic paste. Sauté well till the tomatoes become soft. After the chopped mint and corriander leaves, soya chunks, turmeric powder, red chilli powder. Mix well. Add one cup of thick coconut milk along with 3 cups of water and drained basmati rice. Mix it. When the water starts boiling and check for salt. Amount of water will vary according to variety or quality of rice. My ratio for rice and water is 1: 2. 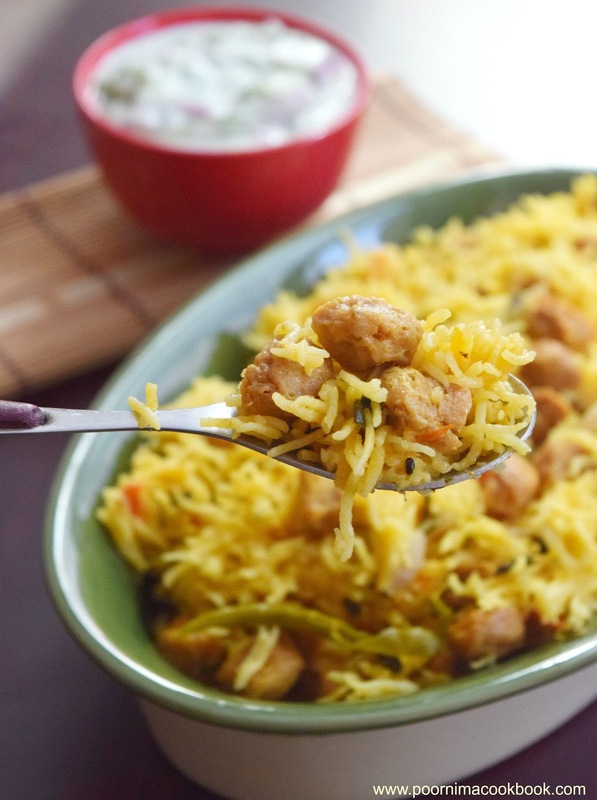 Instead of coconut milk; you can cook this biriyani by using only plain water. You can also add vegetables like peas / carrot / potato in this preparation. 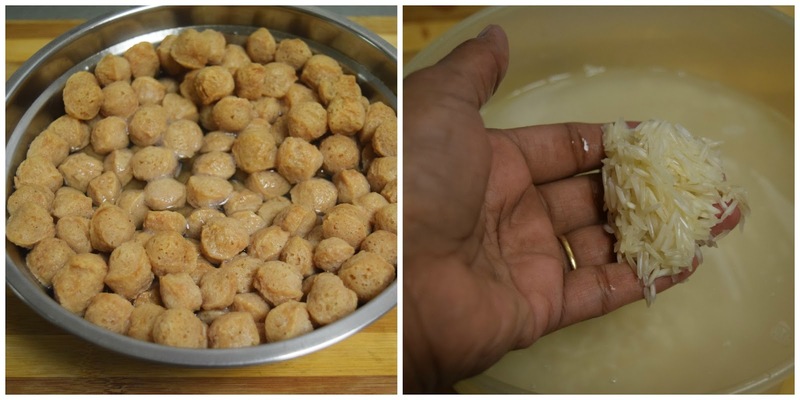 You can also chop the soya chunks into pieces and use it in this preparation. 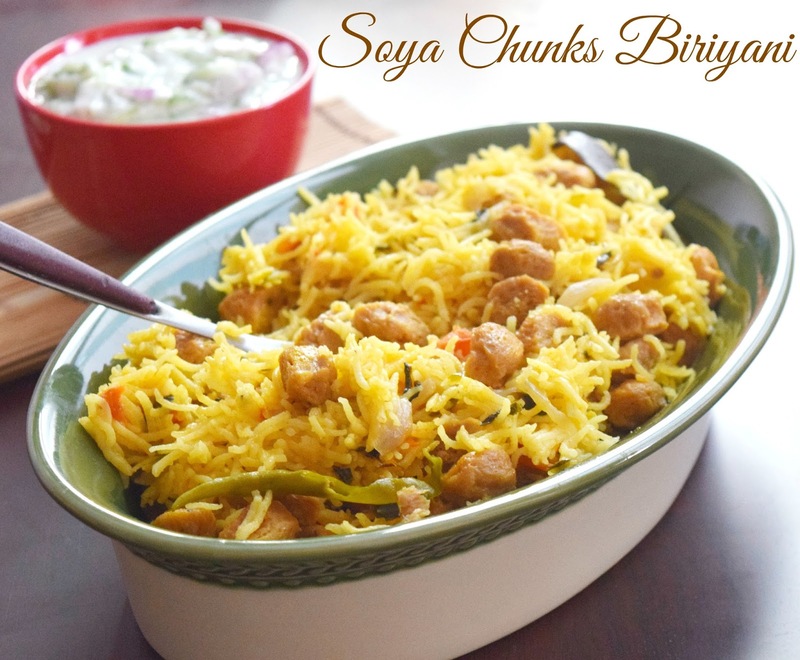 Very happy to hear that soya chunks biriyani came out well and also felt happy that Sarvesh kutti too liked it! Thanks a lot for writing to me about it.